Now that we have seen how BOOTP messaging works in general terms, let's take a closer look at the detailed operation of the protocol. This will let us more clearly see how clients and servers create and process messages, and also help make sense of some of the important fields in the BOOTP message field format. Understanding the basic operation of BOOTP will also be of use when we examine BOOTP relay agents, and even when we discuss DHCP. The following are the basic steps performed by the client and server in a regular BOOTP bootstrapping procedure (see Figure 255). 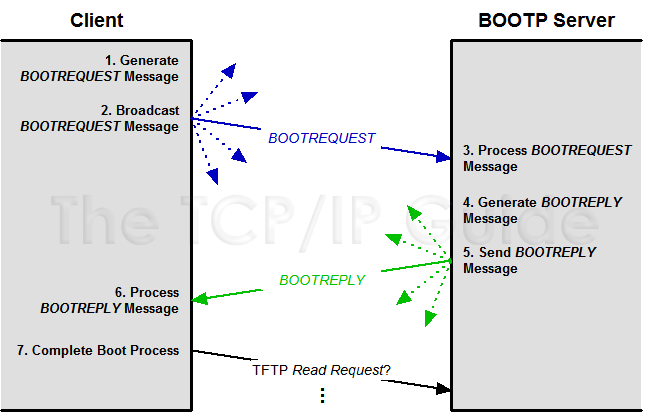 The Boot Protocol uses a simple two-step message exchange consisting of a broadcast request and broadcast reply. After the client receives configuration information from the BOOTP server, it completes the bootstrapping process using a protocol such as TFTP. It sets the message type (Op) to the value 1, for a BOOTREQUEST message. It puts its own layer-two hardware address in the CHAddr field. This is used by the server to determine the right address and other parameters for the client. It generates a random transaction identifier, and puts this in the XID field. The client may specify a particular server that it wants to send it a reply and put that into the SName field. It may also specify the name of a particular type of boot file that it wants the server to provide in the File field. The client may specific vendor-specific information, if programmed to do so. The client broadcasts the BOOTREQUEST message by transmitting it to address 255.255.255.255. Alternately, if it already knows the address of a BOOTP server, it may send the request unicast. A BOOTP server, listening on UDP port 67, receives the broadcasted request and processes it. If a name of a particular server was specified and this name is different than the name of this server, the server may discard the request. This is especially true if the server knows that the server the client asked for is also on the local network. If no particular server is specified, or this particular server was the one the client wanted, the server will reply. It changes the message type (Op) to the value 2, for a BOOTREPLY message. It takes the client's specified hardware address from the CHAddr field, and uses it in a table lookup to find the matching IP address for this host. It then places this value into the YIAddr (your IP address) of the reply. It processes the File field and provides the filename type the client requested, or if the field was blank, the default filename. It puts its own IP address and name in the SIAddr and SName fields. It sets any vendor-specific values in the Vend field. If the B (Broadcast) flag is set, this indicates that the client can't have the reply sent unicast, so the server will broadcast it. If the CIAddr field is non-zero, the server will send the reply unicast back to that CIAddr. If the B flag is zero and the CIAddr field is also zero, the server may either use an ARP entry or broadcast, as described in the previous topic. Once configured, the client proceeds to phase two of the bootstrapping process, by using a protocol such as TFTP to download its boot file containing operating system software, using the filename the server provided.